Set in a distant future, a series of natural disasters threatens the survival of every species on the planet. As you venture deeper into the wilderness, do you have what it takes to make it out alive? Inspired by nature documentaries, AWAY: The Survival Series is a 3rd-person adventure game that takes you on the Sugar Glider's breathtaking journey into the wild. Watch the world around you come to life as you explore a rich diversity of stunning environments and uncover the hidden life that lies deep within the forests, caverns, and swamps. Sitting near the bottom of the food chain, the Sugar Glider makes up for its small size with superior agility as you jump, climb, and glide through your surroundings. Having worked on hundreds of major game and movie soundtracks, including the Planet Earth II and Life nature documentaries, Mike Raznick brings his experience as a multi-award winning composer and audio director to AWAY with an enchanting orchestral score. 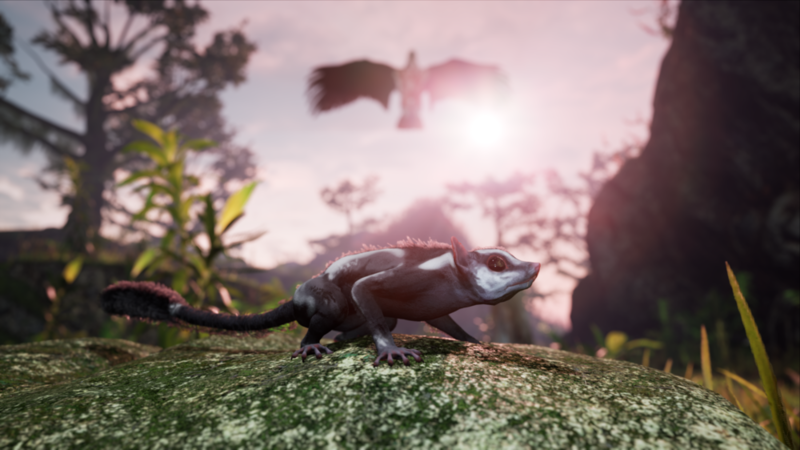 Take the Sugar Glider for a test drive as you hunt lizards, climb trees, and glide your way through our early prototype for AWAY. Your feedback helps us improve the game, so please don't be shy, let us know what you think! With AWAY coming soon to PC, we wanted to let you explore undiscovered sections of the AWAY universe from an entirely new perspective. In our VR Playable Teaser, you enter the world of the Bearded Vulture as a volcano eruption forces you to flee your nest and fly to safer ground.